Posted in FPMT Community News, FPMT News Around the World. His Holiness the Dalai Lama’s Birthday celebration, Réunion Island, July 2018. Photo courtesy of Gyaltsab Je Center. 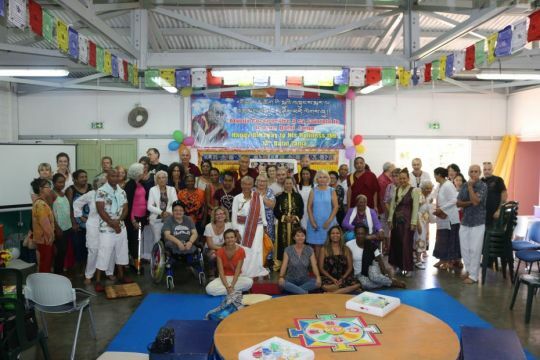 Marc Salamolard, center director of Gyaltsab Je Center on Réunion Island east of Madagascar shares a summary of the celebration held for His Holiness the Dalai Lama’s eighty-third birthday. Réunion Island, July 2018. Photo courtesy of Facebook page Monks Reunion. On Saturday, July 7, 2018, Gyaltsab Je Center, Tara Association, and Kalé-Kalé hosted a big celebration for His Holiness the Dalai Lama’s eighty-third birthday. Tara Association and Kalé-Kalé are local nonprofit organizations that sponsor Tibetan youth and monks in India. We were very pleased to welcome one hundred guests from the local community as well as five monks from Gyumed Tantric College in Mysore, India. The first thing guests saw when they arrived at the party was a large banner on the roadside. 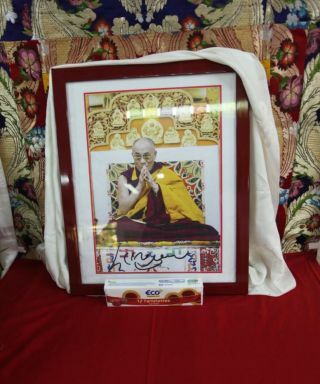 We also showed our guests photos of His Holiness taken at different points throughout his life. We performed a puja together and then watched a video about His Holiness the Dalai Lama’s life. We presented and then cut a beautiful birthday cake. All of our guests enjoyed the lunch that we offered, as well as the desserts, which were kindly brought by our guests. It was a very peaceful, joyful, and lovely day.